MightyMerchant allows you to collect email addresses from site visitors who want to opt in to your mailing list. The opt-ins can be saved to a .csv file that can be downloaded from your Site Manager, or can be integrated directly with a number of email marketing providers, including Constant Contact, MailChimp, and Vertical Response. If you are integrating with an email marketing service, such as Constant Contact or MailChimp, please refer to instructions for that particular service. MightyMerchant allows you to save mailing list opt-ins directly to a Constant Contact list. In your Site Manager, click "settings", then edit the Optin Provider field. Select "Constant Contact", then "next"
Copy the Redirect URI, which will be specific to your domain. You will need this information when filling out the request form. 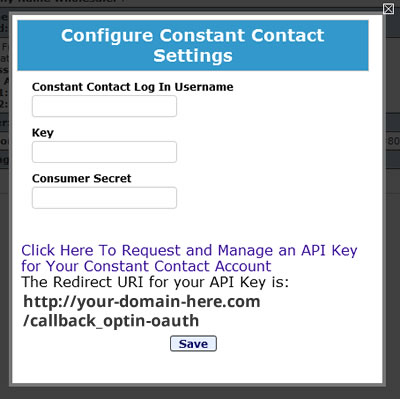 Use the link in the configuration pop-up to request an API Key from your Constant Contact Account. When you're done requesting the API Key, you will see the key and a consumer secret. One at a time, copy and paste these numbers in the box show above (this should be available in another tab in your browser). Enter your Constant Contact user name, then Save. Click the "Link Your Site to Constant Contact" link. Log in with your Constant Contact user name and password. Your site is now ready to send opt-ins directly to your Constant Contact account. Be sure to test. Lists with these names will be automatically created in your Constant Contact account, if they are not already created. Please see our instructions below for information on Adding/Updating Your Opt-In Messaging. MightyMerchant allows you to save mailing list opt-ins directly to a MailChimp list. Log in to your MailChimp account and make sure you have created at least one list. 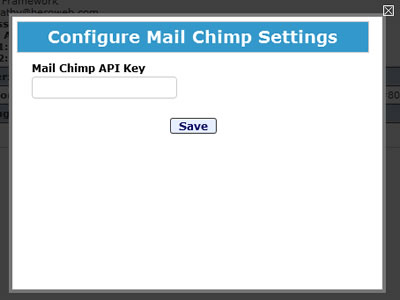 Generate an API key In your MailChimp account. Enter the API Key, then Save. To complete the integration and enable the Opt-In to Mailing List feature on your Checkout pages is as easy as enabling two message fields in your Site Manager. As usual, log in to your Site Manager and click the "messages" link in your navigation area. Your site is now ready to send opt-ins directly to your MailChimp account. Be sure to test. If you would like your opt-ins to be added directly to a specific list, you will need to provide the list name to HEROweb. MightyMerchant allows you to save mailing list opt-ins directly to a Vertical Response list. 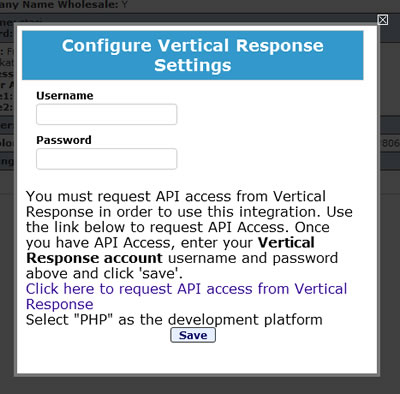 Select "Vertical Response", then "next"
Fill out the request form. Be sure to enter "PHP" as the development platform. Your site is now ready to send opt-ins directly to your Vertical Response account. Be sure to test. Lists with these names will be automatically created in your Vertical Response account, if they are not already created. If you choose not to set up an account with one of the above email marketing providers, you can also set up mailing list submissions to save to a .csv file. You will be able to access this file via the site manager and have this data on hand should you decide to sign up with an email marketing provider in the future. Select "Save to File", then "next." Choose whether or not you would like to be notified by email when someone signs up for your mailing list. If you choose the "No" option, you will still be able to access a current list of email signups via your site manager at any time. Once you have configured your settings, please let HEROweb know so that we can set up your link to download mailing list signups from the site manager. You can contact us using the orange Help Beacon button at the bottom of your site manager, or by using our Online Support Request Form. Submit your mailing list signup form as a test. 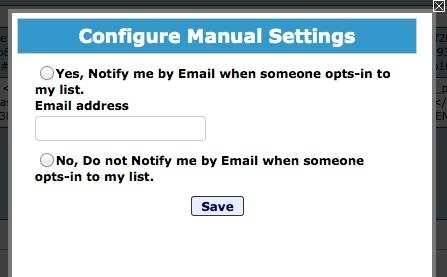 If you have configured your settings so that you receive an email notification on signup, please ensure that you have received that notification. Log into your site manager and click "catalog." Click the "Download Mailing List Optins" link in the blue bar at the top of your site manager. A .csv file of mailing list signups will now be downloaded to your computer. Under "messages", edit the Optin Teaser Message and Optin Details fields. The Optin Teaser Message, like "Join Our Mailing List" appears to the left of the opt-in checkbox and is optional. The Optin Details text appears to the right of the opt-in checkbox and would contain some details of the benefits of joining. This field is required if you wish the opt-in to be available during checkout and on the contact form. If you don't see these messages in your messages manager, please contact HEROweb using your orange Help Beacon button or by filling out our Online Support Request Form.